[regression] Compiz: Visible tearing is worse in 11.10 than 11.04, even when "Sync To VBlank" is enabled, but only when Unity is active. You might expect that with "Sync To VBlank" enabled in compiz that video tearing doesn't happen. But it does, just less often. This appears to be a regression in Ubuntu 11.10, because in 11.04 "Sync to VBlank" was working reliably and eliminated tearing. Strangely, disabling just the Unity plugin in CCSM solves the problem and all tearing goes away. This seems to be related to bug 861061 where the Unity plugin also degrades application frame rates. Both issues are instantly solved by disabling just the Unity plugin. In CCSM, Workarounds, enable "Force full screen redraw (buffer swap) on repaint". With some graphics drivers like the NVIDIA proprietary one, this workaround may introduce stuttering and halve the framerate you see. That is expected with some drivers and is fixed by the same compiz fix that is proposed for this bug. 1. Open Catalyst Control Center. 2. Go to 3D > More Settings. 3. Set "Wait for vertical refresh" to "On, unless application specifies". Subscribed smspillaz. I hope we can make progress on this issue eventually. Screenshot of what to enable for a workaround. I think that fixing this bug will also resolve bug 201342. A small breakthrough today: I discovered the issue is not compiz, it's just the unity plugin. The tearing stops when you disable the unity plugin. The same is true for performance bug 861061. Both issues seem to be caused by an unreasonable amount of overhead that the unity plugin introduces into compiz. And both issues are new in Ubuntu 11.10, so it's a regression. + when Unity is active. Actually, I've now discovered a second root cause, this time in the composite plugin. So unity and composite are both responsible for triggering this bug. I have now proposed fixes in both unity and compiz. Either one works fairly well, but you will get the best performance and the least tearing when both fixes are applied. - when Unity is active. + enabled, but only when Unity is active. Further testing shows that the proposed compiz fix contributes more toward reducing tearing than the related unity fix (fix-861061-trunk). But again, both fixes are incredibly useful. - enabled, but only when Unity is active. + "Sync To VBlank" is enabled, but only when Unity is active. With respect to this bug, it is the tearing seen when dragging windows around when running Unity. 2. In Compiz, improving frame timing so that it is more resistant to latency regressions in plugins. I know there are many possible causes of tearing, and I'm not claiming to fix all of them. But these two fixes are a good start. Will be interested to see the results, as far as tearing in video scenes prone to it &or tearing tests 11.10 is the 1st release I've never been able to totally remove, though it extends to all sessions. Have no idea if related, time will tell I guess..
in CompizConfig Settings Manager (OpenGL section). This is the default setting when Ubuntu 11.10 is installed. 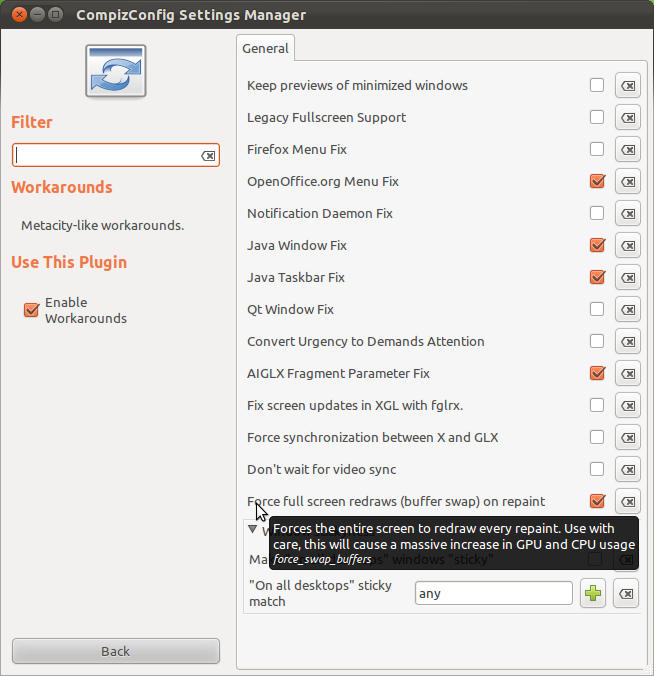 CompizConfig Settings Manager (Workarounds section). tearing in oneiric with the fix is no longer worse than in natty. because it is broken and misleading (bug 898548). Please leave feedback in the relevant bug reports. with Unity 4.x compared to 3.x (LP: #880707). I don't expect the compiz portion of this fix will be seen in an Ubuntu release until 12.04. No need for me to have it in progress. Still keeping the upstream portion in my name. Turn vysnc on in both NVIDIA and Compiz. Do NOT turn on "undirect fullscreen windows". Leave that workaround UNCHECKED or you'll have tearing in fullscreen. I would think option A would be better since I think option B is just wasting processing power rendering things that won't actually be drawn. Thank you very much Daniel for your unity and compiz patches. - minor tearing using Gnome-shell (upper part of the screen). - zero tearing using Windows 7 aero enabled and any ubuntu desktop environment disabling composite. Zero tearing setting "Force fullscreen redraws on repaint" on Compiz as well, but in this case I get an inacceptable framerate drop. In my case your patches reduced tearing and improved smoothness in Unity to the level I get in Gnome-shell. Thanks for pointing me to this bug and your patches. I can confirm that after installing them there's just occasional video tearing in Unity - similar to Gnome 2 and Gnome Shell. In my experience this config looks the nicest. But it's not enabled by default because it theoretically uses more CPU. No tearing at all, but with this settings video playback is quite jittery and widow movement looks worst. It's very slow and windows lag behind mouse. Heavy tearing in video playback, window movement very fast but with tearing. For me option 3 is least wrong of all. Tomek, that's good news. Your preferred configuration is the default configuration for compiz in Ubuntu. The theoretically perfect solution, for optimal performance and zero tearing, is proposed in bug 901097. However it's presently buggy and requires more work, possibly a lot more work. totally solves both tearing and performance issues in the same time on my configuration, Nvidia ION. Though I don't know what exactly this line does, I hope this information can be useful for compiz development too. This bug is specifically about Compiz and Unity. Tearing in Gnome Shell should be discussed in a different bug. Also, bug 764330 looks similar to some of the issues fixed by the fix to this bug, however it is actually very separate. Bug 764330 is about the compiz Move plugin only. A fix for that is available for testing in ppa:vanvugt/compiz too. - "Sync To VBlank" is enabled, but only when Unity is active. + when "Sync To VBlank" is enabled, but only when Unity is active. Of course. My intentions were not to discuss about a bug in Gnome Shell, but it's compositor and compiz had similar problems. Now a solution has been found for Gnome Shell's compositor and since it is open source I hope this helps for compiz too. No problem. Thanks for the info because I know it will help many people. The fix for the unity portion of this bug (the fix for bug 861061) is now committed to lp:unity r1816. I've deciphered some of the branching chaos and found the (unity) fix has slipped into lp:unity/4.0 already (r1726). Now I have created the missing branch links, it's more obvious. Sam, please be careful. You obviously lost track of which bug fixes your merge proposals contained. But it's excellent to see the fixes for bug 861061 and bug 880707 actually being released. This bug is now fix-released in unity 4.28.0 "SRU2". Could someone please fix the "unity" Milestone column to show this? Didier, I know the unity fix is not released for Unity 5.x yet, but it is definitely already Fix Released in Unity 4.28.0. Is there a more elegant way to represent this? The same goes for bug 861061. I now see the correct status should be like that of bug 887465. Could someone please mark this bug as Fix Committed in unity 5.0.0, and Fix Released in 4.28.0 "SRU2"? But as mentioned earlier, it was accidentally omitted from the changelog. As was bug 861061.